Breaking news – Toby and Kelly are overweight! When our new boy Kevin came home I started worrying immediately that he was too skinny. After we starting working on stepping up in particular, I remarked to Patrick that he felt like nothing on my finger compared to Toby or Kelly. I didn’t think that an already freaked out Kevin would appreciate hopping on a Food Scale for a weigh in, so I decided to weigh Toby and Kelly instead for a baseline. I haven’t weighed them in several months and was horrified to find that I have fat parakeets! Toby is just a little bit into the obese range, but Kelly weighs so much that it’s almost unbelievable. In true parenting-denial style, I found myself moaning, “but she’s big-boned”! And then had to have a good laugh at myself! Here’s how I think this happened, even though they are technically only getting two tablespoons of seed mix each per day. One, at the beginning of summer I got a new job and started working late and generally exhausting myself trying to get up to speed. When I would get home from work I would let the parakeets out and basically collapse on the couch, trying to cool my over-heated brain. This meant way fewer days where Toby and Kelly got their afternoon fruit or vegetable supper. Two, I ran out of Roudybush Daily Maintenance Bird Food, Nibles and for some reason didn’t buy another bag. 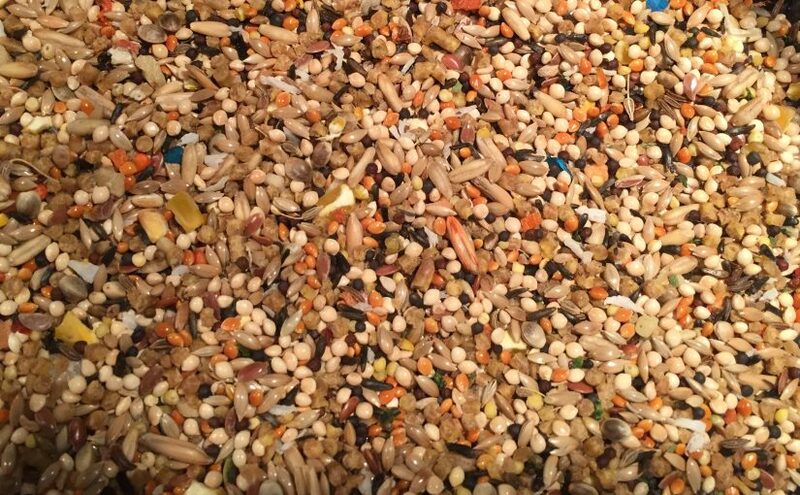 So that meant that our bird mix went from 1/4 pellets to half Dr. Harvey’s Our Best Blend Natural Food for Parakeets and half Volkman Avian Science Super Parakeet . Neither of these are “bad”, they are both high quality mixes with a lot of good stuff in them. But, I do think that increasing seed intake, eliminating pellet intake and reducing vegetable availability all at the same time was a recipe for fat parakeets. Three, I introduced those darn food silos. Not only did they increase mess by 100% but they also made eating both extremely fun and a competitive sport. They are no longer being filled but I’m keeping the food silo on hand because I still think it would be a good back-up food source when we are on vacation. Knowing how it happened is good I think, so that I can avoid making the same mistakes in the future. 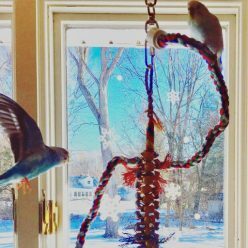 Keeping parakeets at a healthy weight is critical to health and longevity, and I want to keep these guys around for as long as possible! The first order of business was to break out my OXO Good Grips Grater and starting making fruits and vegetables a regular diet staple again. This is the one thing that I never should have let slip, and I’m committed to doing better by them going forward. Particularly seeing how they dive into a plate of good food, made me feel pretty guilty for leaving it off the menu. Next on the list is getting pellets back into their daily diet. We’ve always used Roudybush pellets, but I’ve heard some amazing stuff about Harrison’s, and this seems like a good time to switch. We are going to try Harrison’s High Potency Super Fine , and I’m sure I’ll be reporting back with a review, and maybe another Amazon gift card giveaway, in January. Eliminating food silos, keeping up with regular fruit and vegetables offerings, and putting pellets back into the seed mix should be enough to shed some of those pesky ounces! 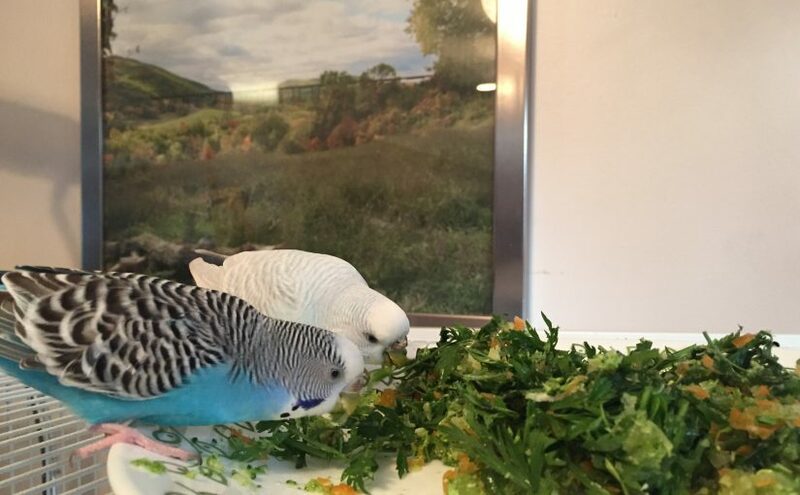 Posted on December 15, 2017 December 13, 2017 Categories Our Parakeet StoryTags basics, health, parakeet diet, parakeet health, seed9 Comments on Breaking news – Toby and Kelly are overweight! 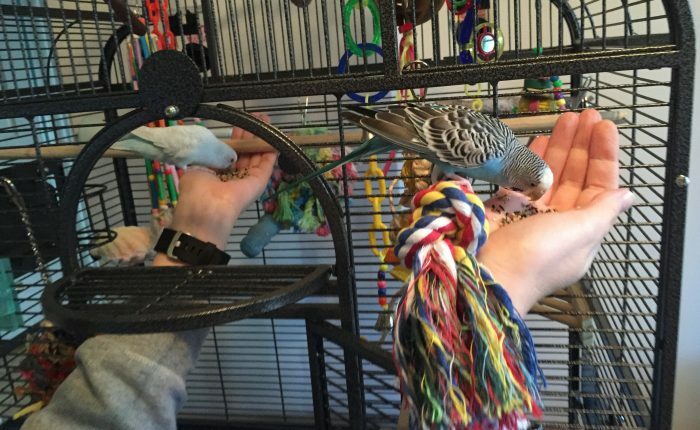 I read an article recently called “Are we killing the natural instincts of the budgerigar” which put me on notice that no matter how many stimulating toys I provide, or flight time, or any material object, I have been ignoring a major component of my parakeet’s mental and physical health. That component is foraging for food. You should read the whole article, but to condense, the experiment they are conducting in an aviary setting changed the budgies over from eating readily available seeds in shallow bowls that are refreshed every day, to serving food in deep bowls and not refreshing constantly, so the budgies would have to dig for their food. It also involves spreading the remaining seed on the aviary floor at the end of the cycle, instead of throwing it out, so that the budgies could sift through it again, simulating the ground foraging their wild cousins do, as well as getting much more use out of the provided seed. The article inspired me to make some changes, because I am of course one of those people who feeds every day and discards every day, meaning the chances for foraging are extremely limited. My big change was to take out the grate at the bottom of the cage. It took a couple of days, but the budgies love going down there and hunting through the seed hulls that fall out of their bowls. This also means that when I serve them vegetables they can go down to the cage floor and “forage” around in them. Like the green pepper shown above. They love ripping off all the seeds and then coming back to go through them all over again. 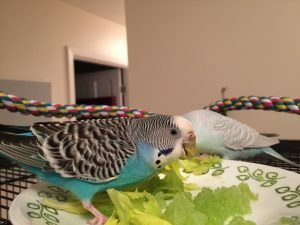 Right now they have a cup of torn romaine lettuce that they are digging through and throwing all over, and then going back to forage around in the lettuce leaves. I also tried scattering what was left of their seed bowls on the ground of the cage, which would be okay a couple of times a week but really caused a mess explosion, due to the dramatically increased likelihood of hulls being blown out of the cage. My next steps are to create more foraging opportunities. 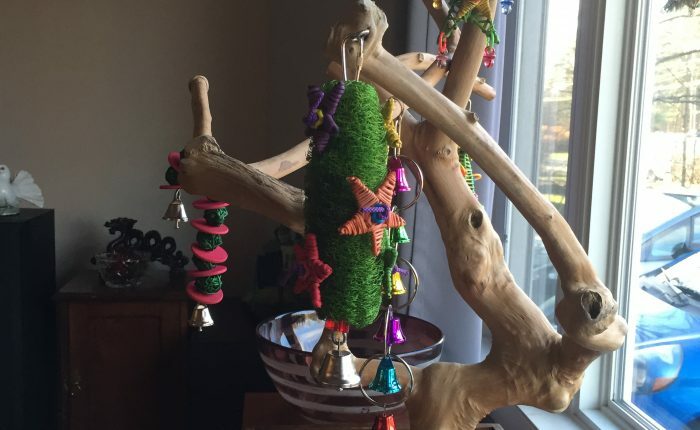 I always see foraging toys for big parrots, but I think for the little guys it may have to be a little more DIY. Here’s a great idea for a foraging mat just made out of a doormat, and here’s another post about making a bunch of different foraging toys – some seem to be for bigger parrots, but there are some awesome easy things the the blogger suggests, even something as simple as covering the food bowl with a paper towel that the parrot has to remove before eating. For higher up foraging, we are going to get back into using our Creative Foraging Systems Ball and Kabob Pet Feeder . 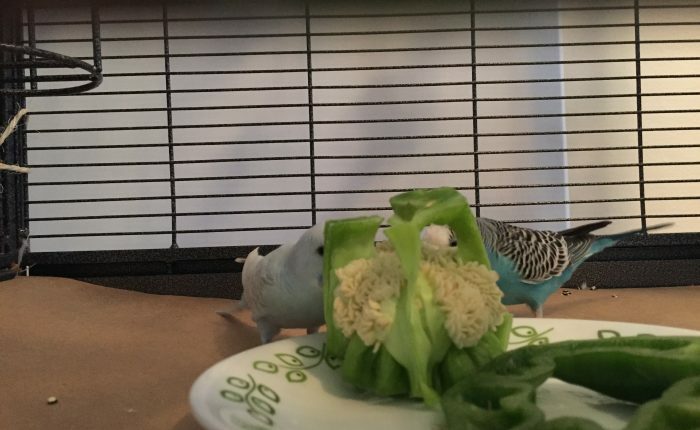 If we put some shredded veggies in the ball the budgies will spend the bulk of their day pulling them out, whether they eat them or not, so at least mentally there’s the simulation of working for your food. The importance of foraging and digging through food also reinforces my decision to switch to a mostly seed diet, with pelleted diets a budgie would have even less opportunities for foraging. And with Dr. Harvey’s Food for Parakeets there are a lot of different items in the blend to be foraged through and pushed aside to find the favorite morsels, and then throughout the day more and more of the less desirable items are consumed. Overall, I want to be more cognizant of how I could be making it harder and more rewarding for Toby and Kelly to find food, after reading that article I’m certain I can do better at meeting their need to forage.